Forestaire International, a division of Forestaire NZ, was created to accommodate the ever growing international market. 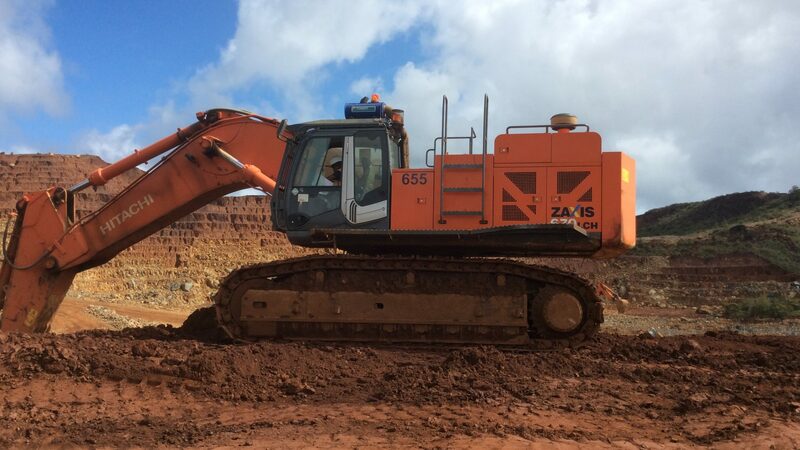 The International division is primarily involved in the design, manufacture and installation of air conditioning and cabin air filtration systems on machinery working in the harsh mining industry. As a necessary requirement to provide on-going service to our clients in the Pacific Islands, we have set up a fully functioning workshop which provides full back up service. The ability to offer on-site service maintenance has many advantages. Overall reduced cost of system repairs. Forestaire is proud to introduce the latest innovation in positive pressure cabin air filtration systems. 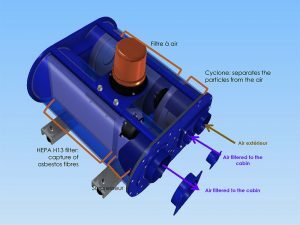 The purpose of this custom designed system is to provide clean air inside the cabin of a machine that operates in a harmful environment, specifically in asbestos dust laden areas. The unit works by drawing in air from the atmosphere and then moves it into a cyclonic orbit which displaces the heavier particles to the outer orbits which are then ejected back into the atmosphere, the finer dust particles are then captured by the fine hepa filter. 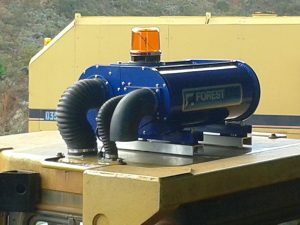 A return air vent also draws air out of the cabin to ensure any dust the operator may have entered the cab with on his clothing or boots etc is removed and filtered. It is expected that the primary or Merv filter will last approximately two years this is dependent on the application. Such things as working environment i.e. exposure to dust, type of machine and application which will affect the life of the actual filter element and the ability of the media to withstand the specific environment. It is expected that the Hepa filter will have a life expectancy of up to five years, This will based on the actual ability of the media to withstand the specific environment of the machine and the area it is working in. Units are manufactured of heavy Aluminium construction to withstand the most serious damage. There are minimal flat surfaces to prevent dust build up. The units are sand blasted and powdercoated with a high temperature two step procedure to provide as much protection as possible against the environment. All assembly uses nitrile gaskets where necessary and all fastenings are stainless steel to give serviceability over as long a time span as possible. The flashing light supplied as standard is a high quality unit manufactured by PRECO in the USA and incorporates LED technology and a brushless motor. This unit has proven to have extremely high visibility on the units currently in service. Interconnecting ducting is TPR vulcanized rubber this is a double layer ducting that is installed to provide resistance against abrasion and being rubber has a very high UV resistance. It is our intention to be able to supply full interface kits for most machine types as we progress through the various installations, but the systems come with a basic field fitting kit that includes ducting and cab termination flanges. Each system has a separate dash display in a sealed enclosure with generic mount bracket . Each display shows actual cabin pressure and red flashing indicator light. The controller is manufactured using proven componentry already in use in the HVAC industry and has been chosen for its robust capabilities. The controller is a microprocessor based system which will allow future adjustment of all settings to meet application requirements specific to customer’s needs. The controller is housed in a sealed dustproof enclosure and is available with the correct interface for cab mounting to specified machine types. The controllers are essentially plug and play although commissioning is done on all machines to ensure pressure and fan speed are correct for the application all wiring is supplied with the unit with receptacles on the controller for connection. As it becomes available connection information for each machine will be included. The unit is connected using weatherpack plug connections field fitted during installation. As an added advantage because all units are identical it is expected that spare units will be held in stock by the customer and should there be an issue with a unit in the field, rather than opening it in an uncontrolled environment, simply by unplugging three plugs, two hose clips and four M10 nyloc nuts the unit can be changed out. There by limiting exposure of service personnel to asbestos.